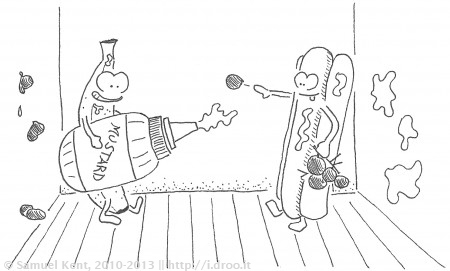 No fair – mustard in my buns! a bowl of rank tomatoes. a mash of some potatoes. Toph woke up early enough to watch me drawing this one. I asked him if he knew what it was and he thought the banana was a man with a mustard bottle, so I asked him to help me make it look more like a banana. His recommendation was to add a little black to the bottom of the banana (saying, “I need some black right there”) and some more spots.